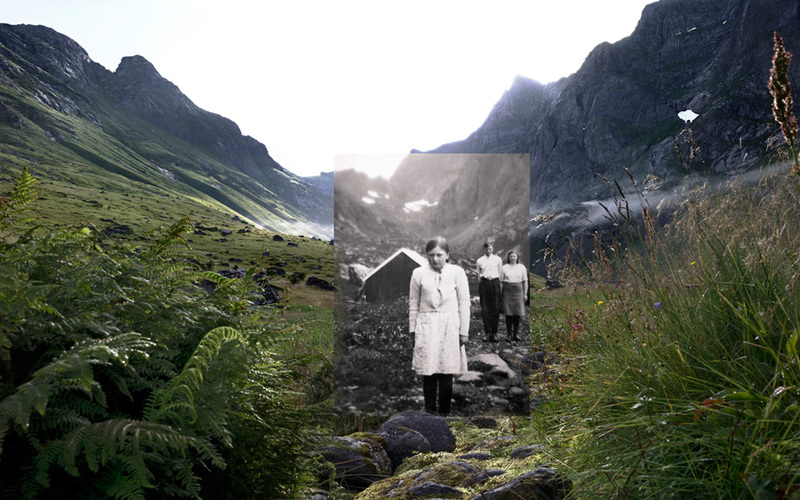 Around 1950, families in small and remote fishing villages in Lofoten, Northern Norway, were offered a lump sum from the Government to leave their homes and relocate at more central places. They also committed never to return and resettle. This was part of the governmental plan to centralize and modernize the nation after the Second World War. Historic photographs from these places are returned to where they once were taken, linking past and present together. The project is about the passing of time, history, destiny maturity and changes in society. Communities that had survived for centuries in a hostile environment on the border between steep mountains and rough sea, totally isolated during the winter months, collectively decided to leave. Neighbors and friends through generations packed all their belongings and left their homes and each other. The villages were abandoned within months. Due to shortage of building material, they dismantled their houses and brought their homes with them as well, leaving only the foundations. The traditional self-sufficient way of life were lost and a part of the coastal culture with it. Today, 60 years later, nature has reclaimed the areas. Looking closer however, signs of past lives still remains; stone fences and foundations still standing, hidden paths and traces of gardens with herbs and flowers.